The LIXIL Group is constantly enhancing its products and services across the Group to ensure continued and improved customer satisfaction. To ensure that our customers enjoy all aspects of their living spaces, the LIXIL Group focuses on developing products and services that satisfy both construction-related commercial customers and end consumers, while communicating with them effectively. We work continuously to improve products and services based on customer feedback and needs. 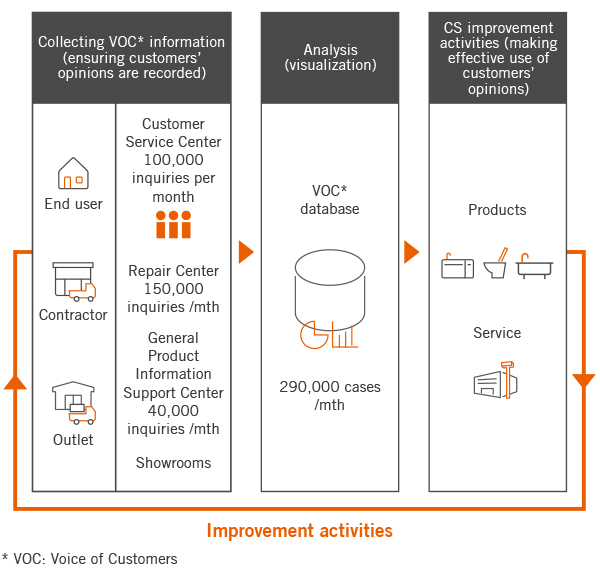 LIXIL Corporation considers customer satisfaction a significant element of its business activities, listening attentively to the voices of our customers (VOC), and channeling those opinions into creating better products and services. We have introduced and subsequently developed the Six Sigma system to ensure this framework and culture takes root. The Six Sigma system involves listening to customer opinions and pinpointing issues for improvement. Then, instead of making judgements based on instinct and experience, we focus on facts derived from numerical analysis to help control any variation in our work and services, ultimately helping to lead to quality improvements. One of the quality-improvement initiatives involves creating a cross-functional team in each Group company and division, and implementing projects to improve issues. LIXIL Corporation conducts satisfaction surveys of its commercial customers. 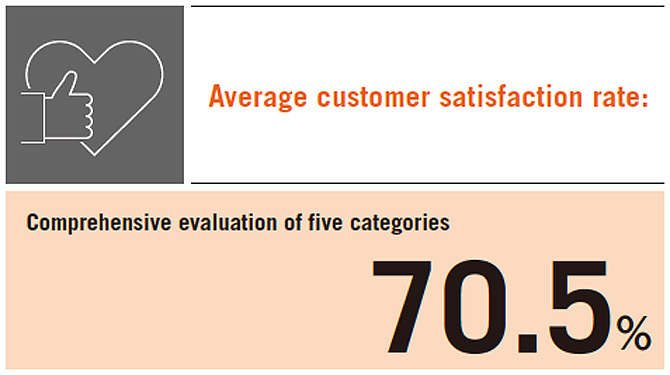 In FYE2018, we achieved an average of 70.5% in terms of the quality of our products and customer support, including showrooms, call centers, aftersales maintenance, and sales representatives. We also collect approximately 300,000 comments from customers each month through our customer service center, repair center, and product information support center. This data is stored in our database and shared with relevant departments to encourage improvement measures, and ultimately boost the quality of our products and services. We hold practical construction-related training workshops for commercial customers on sashes, doors, exteriors, kitchens, and bathrooms with the aim of improving end consumer satisfaction. We also conduct regular training for employees to improve their level of knowledge about our overall work and products so that they can resolve any problems customers face. Furthermore, we seek to boost motivation by offering rewards for excellent customer service skills.